Tuesday marked the fourth and final day of play at the World Poker Tour Lucky Hearts Poker Open at the Seminole Hard Rock Hotel & Casino in Hollywood, Florida. When the final day began, only six players remained to fight for the $268,444 first-place prize. Already guaranteed $42,185 for making the final table, the player who finally walked away with the title was familiar with being in the top spot. After Day 1 and Day 2, Matt Juttelstad held the chip lead. After Day 3, he sat in second place. And after Day 4, Juttelstad was kissing the trophy and holding bricks of cash, following a 303-hand final table. Keith Ferrera was the first player eliminated. During Level 23, with the blinds at 10,000/20,000/3,000, Ferrera's final hand came up. It was the 89th hand of the final table, and Juttelstad raised to 45,000 from middle position. Ferrera reraised out of the small blind to make it 120,000. Play folded back to Juttelstad who didn't back down, four-betting to 305,000. According to the WPT Live Update Team, Ferrera tanked for roughly two minutes and then moved all-in. Juttelstad made the quick call holding . Ferrera was at risk with . The flop came down and Ferrera took the lead with a pair of jacks after out-flopping Juttelstad's nines. The on the turn didn't change too much, but Juttelstad did pick up four additional outs to a gut shot straight draw. Still, Ferrera was in front. The river card delivered a dagger to Ferrera with the and vaulted Juttelstad back to the lead with a set of nines. With no more cards to come and Juttelstad having his opponent covered, Ferrera was sent to the rail in sixth place. His payday was worth $42,185. Five-handed play lasted over 100 hands before the next player was eliminated in fifth place. That player was Todd Jacobson during Level 26 with the blinds at 20,000/40,000/5,000. From the cutoff position, Sharon Levin raised all-in for about 800,000. Jacobson called all-in from the button for less, holding about 600,000 in chips, and everyone else folded. Levin tabled for just one overcard to Jacobson's . Jacobson's tournament life was still alive after the flop, but the on fourth street put Levin in front. Jacobson needed a ten, and only a ten, but the dealer rolled over the on the river. Jacobson earned $54,649 for his finish. A couple of orbits around the table followed Jacobson's exit before Levin fell in fourth place. He raised all-in from the button for 810,000 and Gigi Gagne called from the big blind. Levin held but was in bad shape because he was dominated by Gagne's . The flop, turn and river ran out and Levin was eliminated. He took home $73,344. Uri Kadosh was sent to the rail in third place on the 271st hand of the final table. During Level 28, with the blinds up to 30,000/60,000/10,000, Juttelstad raised on the button to 125,000 and action folded to Kadosh in the big blind. Kadosh reraised all-in for a little over 1.3 million. Juttelstad called with . Kadosh was holding and was at risk. Following an flop, the turn and river completed the board to eliminate Kadosh. He earned $105,463 for his finish. When heads-up play began, Juttelstad held the lead with 6.82 million in chips to Gagne's 2.03 million. From there, Gagne couldn't find any traction and never climbed above 2.3 million in chips as Juttelstad kept knocking her back whenever she tried to get something going. Then, on Hand #303, it all ended with a bang. On the button with the blinds in Level 29 at 40,000/80,000/10,000, Juttelstad limped in from the button and Gagne checked her option to see the flop. Gagne led for 300,000 into the 180,000-chip pot, and Juttelstad just called. The landed on the turn and Gagne moved all-in for 1.805 million. Juttelstad snap-called holding the for the flopped nuts. Gagne had turned a five-high straight with . Gagne was only able to stay alive with a chop, but the river produced the — not the six Gagne needed to keep the fight going. She was eliminated in second place, earning the largest score of her career — $158,194. For his victory, Juttelstad scooped up the $268,444 first-place prize, which includes a $25,500 seat in to the WPT World Championship at the end of the season. 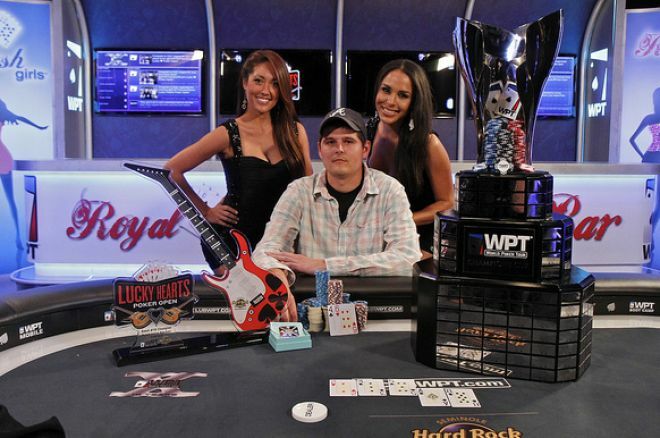 Juttelstad also won the beautiful WPT trophy along with a second trophy from the Seminole Hard Rock Hotel & Casino. The next stop along Season X of the WPT will be the L.A. Poker Classic held at Commerce Casino in Los Angeles, California. The $10,000 Main Event will begin on Feb. 24 at 1200 PST and PokerNews will be providing daily recaps of the event. Last year, Gregory Brooks took the title and the winner's take of $1,654,120. This event always has the biggest names in the game out for action as well as a massive field, so you won't want to miss it. There will also be a $25,000 High Roller that kicks off on Feb. 26 at 1900 PST.